Cray employees put the finishing touches on Titan at the Department of Energy's Oak Ridge National Laboratory in Tennessee. The supercomputer may be the world's fastest. It's designed to do 20 petaflops — or 20,000 trillion calculations — each second. It consumes enough electricity to power a small city of 9,000 people. 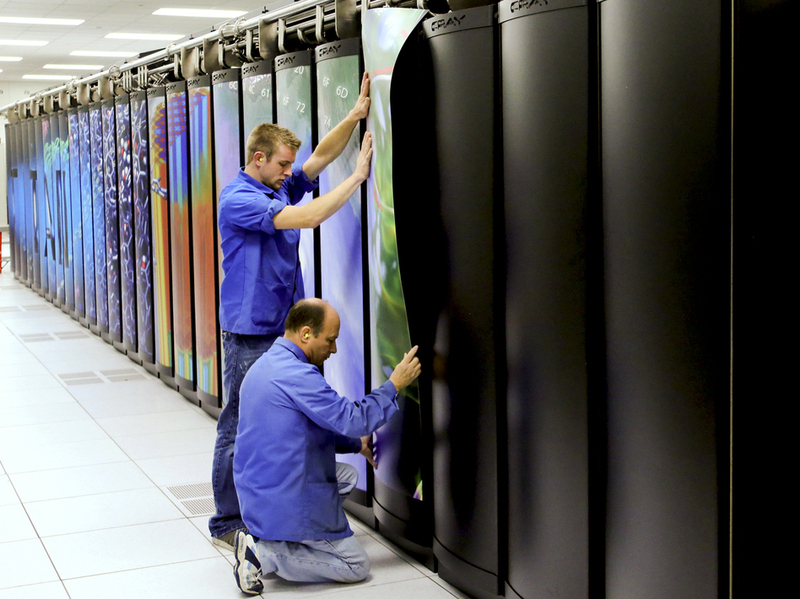 The world's fastest supercomputers have come back to the U.S. In June, the title was claimed by a machine named Sequoia at Lawrence Livermore Labs. Monday, at the Department of Energy's Oak Ridge National Laboratory, what could be an even faster computer comes online. It's called Titan and it would not have been possible were it not for the massive market for video games. The first thing you notice when you visit Titan is the noise. The room reminds me of a 1980s-era Kmart — but much louder. The room is very large, about a half acre. Big stainless steel pipes help keep Titan cool. The pipes have been repurposed from the dairy industry, which is not surprising considering that Cray, the company that built the computer, is based in Wisconsin. Cray built special fans to cool each cabinet. The fans are so powerful the floor in the room vibrates. All of this complicated engineering is in the service of speed. Titan is quite possibly the fastest computer in the world. We won't know for sure for a few weeks, but Titan is designed to do more than 20,000 trillion calculations a second.